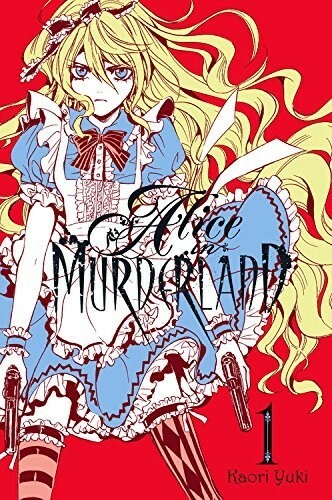 Manga Review: ALICE IN MURDERLAND Volume 1. Alice In Murderland is a very strange manga series that I can’t really describe. The first volume starts off with a monthly tea party that all members of the Kuonji family must attend. It’s hosted by the mother and father and half way through the event you learn that it’s someone’s birthday and an extra celebration – a celebration of murder, is called for. Their mother, Olga, declares that one of the children will become heir of the illustrious family name and assets; however, they must murder each other until one is left standing. The children are blocked off from leaving and the game begins. After a bit of chaos we learn that Stella, the main character, has an almost incestuous relationship with her older brother. Zeno is the first to be murdered and this causes Stella to erupt into a violent rage that literally transforms her into a blonde haired girl who has a murderous streak. Apparently all of the children can unlock this alter-ego and then we learn further into the volume that they’re all adopted by the Kuonji and were given a tea elixir that took away their humanity. The monthly tea parties were a ritual to keep the children alive since Olga made their bodies dependent on the secret ingredients. The whole thing makes little to no sense and the characters are confusing and frustrating to like. I had to flip back and forth between different chapters because I couldn’t remember names or faces. The only characters I remember were the two younger ones and I can’t even remember their names right now. All I recall is that I felt sympathetic towards them since one was so young she was carrying around a stuffed toy. I could go back to the book and flip through but I can’t even recall which chapters had which characters and I don’t want to waste my time. The majority of the people you come across in Volume 1 aren’t well developed and they all seem the same. I also had a difficult time suspending my disbelief. Am I really supposed to buy that the Kounji family are so rich and politically connected that they could hold a death game in their estate without someone on the outside finding out? And as a reader, why am I told so many pages in that these kids were all adopted? This is something that Stella could have told us on page once since she would obviously have the memory of being adopted into the family. Her relationship with Zeno is also incredibly unclear. Is she his blood relation? Were they adopted together? Why are they so close and why does she want him to be her life partner? That is just weird. Oh, and let’s not forget – Olga has the power to resurrect the dead. Just what is going on in this damn mansion? Maybe you can try reading it and letting me know because I sure haven’t figured it out yet. This manga is a hot mess. It’s hard to follow and the story isn’t that interesting. I’m sorry about that because I like to see people succeed – but the characters aren’t developed and the plot seems rushed. This is a situation in which a highly skilled editor needs to step in and help this author create more dimension in the story. Kaori Yuki introduces over thirty characters in just one volume. It’s unnecessary and it’s a bad habit to develop. If Volume 2 reads like this did, then this is a series that should be passed on.